In this beloved sequel of Me Before You, Louisa Clark finds herself struggling after the loss of Will Traynor. Attempts to make her life ‘normal’ once again include going to the Moving On support group, dating the caring and understanding paramedic Sam Fielding, and she’s doing alright until… someone appears that throws off Lou completely. The question is, will Louisa finally move on from her past and focus on the now, the present? I listened to this book on Audible. This may have affected my regards towards the book, as the voice I listened to was… quite depressing. It was a long and tedious 11 hours of listening, and it took me a long time to finish it. But I’m glad I did, because the ending was what pushed my rating up to 4 stars. 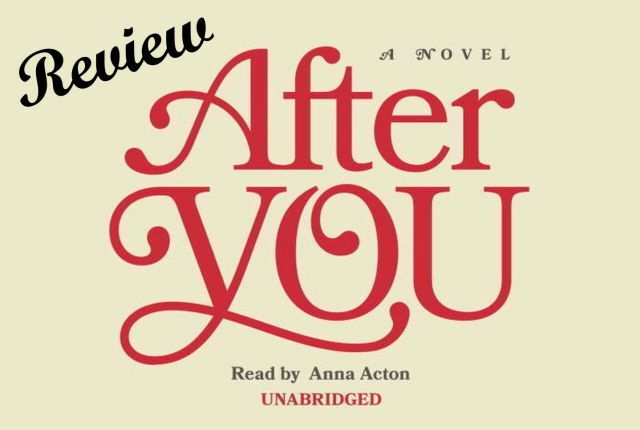 I first read Me Before You several months ago, and I absolutely loved it. But the Lou that I encountered in After You was more… within herself. She no longer has Will to focus all her energy on, and she isn’t living with her family anymore. Besides her family, the main characters in this novel are new in her life. This change in her life concurs with Lou’s wishes to move on after Will’s death, but it’s clear soon enough that she hasn’t moved on at all. I listened to her thoughts whirling through her head over and over again, to the extent that it got too much. I enjoy reading books that explore the characters’ feelings and thoughts to this extent, but not when it gets too depressive and repetitive. However, I felt completely different by the end of the novel. Just like I bawled my eyes out in the last few chapters of the first book, I felt really happy by the conclusive ending of the second book. The last few chapters are amazing, and they really give the reader that feeling of What if…? over and over again. The main focus of this novel is quite personal, actually. On the surface, it’s all about your relationship with your family and loved ones, your work satisfaction, and grieving through the loss of a loved one. Moving on. Ultimately, though, it’s all about you. Getting to know yourself, over and over again. Taking chances. Giving chances. Accepting things the way they are, because that’s how you progressively move past them. Most importantly, cherishing the wonderful life you have. All of this was really brought out near the end of the book, and it was really wonderfully written. Though it was a bit too much in the course of the novel, the ending really made up for it. Normally, I would comment about the author’s writing style in most of my book reviews, but seeing as I listened, and not read, this novel, I can only speculate on it. I didn’t have any issues with Moyes’ writing style in Me Before You, so I think it’s safe to say that it was as well-written in the second novel. However, I did feel and extensive amount of internal dialogues (monologue? ), and I can’t really remember being in Lou’s head as much in the first book, so this was something… different. I didn’t particularly like the depressive voice detailing on all of Lou’s conundrums, but I guess I can see why that was necessary now. I don’t think, if I read another Moyes book, that I’ll ever listen to her audiobooks again, though. If you’re hoping to read a book that really makes you reflect about your decisions in life, I really recommend this book to you. The tone and focus are quite different, but if you enjoyed Me Before You, you’ll probably also like this one, particularly the ending. I cannot wait to read this book because I absolutely loved Me Before You. Although I felt like it was a bit dragged in the middle. If you felt Me Before You was dragged in the middle, I’m afraid I’ll have to spoil it to you and say that it’s much more dragged in After You. But the drama is sooo good, I swear to you. There are some jaw-breaking revelations. Great review!! I’m so happy on how this book turned out. After reading so many negative reviews about it, I’m glad it didn’t disappoint me. I love Lou so much and her character development on this book is so remarkable. Yaas 🙂 I also read several negative reviews prior to reading it myself, but I’m glad I ignored them (because it was worth it). Thank you for your lovely comment!